A trackball is a pointing device consisting of a ball held by a socket containing sensors to detect a rotation of the ball about two axes—like an upside-down mouse with an exposed protruding ball. The user rolls the ball with the thumb, fingers, or the palm of the hand and their nails to move a pointer. 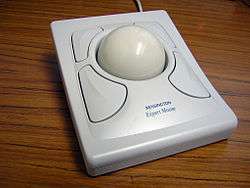 Compared with a mouse, a trackball has no limits on effective travel; at times, a mouse can reach an edge of its working area while the operator still wishes to move the screen pointer farther. With a trackball, the operator just continues rolling, whereas a mouse would have to be lifted and re-positioned. Some trackballs have notably low friction, as well as being made of dense material such as glass, so they can be spun to make them coast. The trackball's buttons may be situated to that of a mouse or to a unique style that suits the user. Large trackballs are common on CAD workstations for easy precision. Before the advent of the touchpad, small trackballs were common on portable computers, where there may be no desk space on which to run a mouse. Some small thumbballs clip onto the side of the keyboard and have integral buttons with the same function as mouse buttons. The trackball was invented as part of a post-World War II-era radar plotting system named Comprehensive Display System (CDS) by Ralph Benjamin when working for the British Royal Navy Scientific Service. Benjamin's project used analog computers to calculate the future position of target aircraft based on several initial input points provided by a user with a joystick. Benjamin felt that a more elegant input device was needed and invented a ball tracker system called the roller ball for this purpose in 1946. The device was patented in 1947, but only a prototype using a metal ball rolling on two rubber-coated wheels was ever built and the device was kept as a military secret. The trackball was first built by Tom Cranston, Fred Longstaff and Kenyon Taylor as part of the Royal Canadian Navy's DATAR system in 1952 DATAR was similar in concept to Benjamin's display, but used a digital computer to calculate tracks, and sent the resulting data to other ships in a task force using pulse-code modulation radio signals. This trackball used a Canadian five-pin bowling ball. Trackballs have appeared in computer and video games, particularly early arcade games (see a List of trackball arcade games) notably Atari's Centipede and Missile Command – though Atari spelled it "trak-ball". Football, by Atari, released in 1978, is commonly misunderstood to be the first arcade game to use a trackball, but in The Ultimate History of Video Games by Steven L. Kent the designer of Football, Dave Stubben, claims they copied the design from a Japanese soccer game by Taito. Console trackballs, now fairly rare, were common in the early 1980s: the Atari 2600 and 5200 consoles, as well as the competing ColecoVision console, though using a joystick as their standard controller, each had one as an optional peripheral. 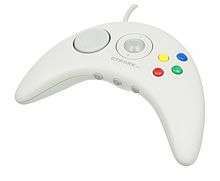 The Apple Pippin, a console introduced in 1995 had a trackball built into its gamepad as standard. Trackballs were occasionally used in e-sports prior to the mainstreaming of optical mice in the early 2000s because they were more reliable than ball mice, but now they are extremely rare because optical mice offer superior speed and precision. A trackball requires no mousepad and enables the player to aim swiftly (in first person shooters). Trackballs remain in use in pub golf machines (such as Golden Tee) to simulate swinging the club. An advantage of the trackball is that it takes less space to move than mouse. A trackball was often included in laptop computers, but since the late 1990s these have switched to track pads. Track balls can still be used as separate input devices with standard desktop computers but this application is also moving to trackpads due to the prevalence of multi touch gesture control in new desktop operating systems.